For my birthday last weekend I wanted to make a fun signature cupcake inspired by fall. My favorite autumn treat is a caramel dipped apples so naturally I knew exactly where to start. 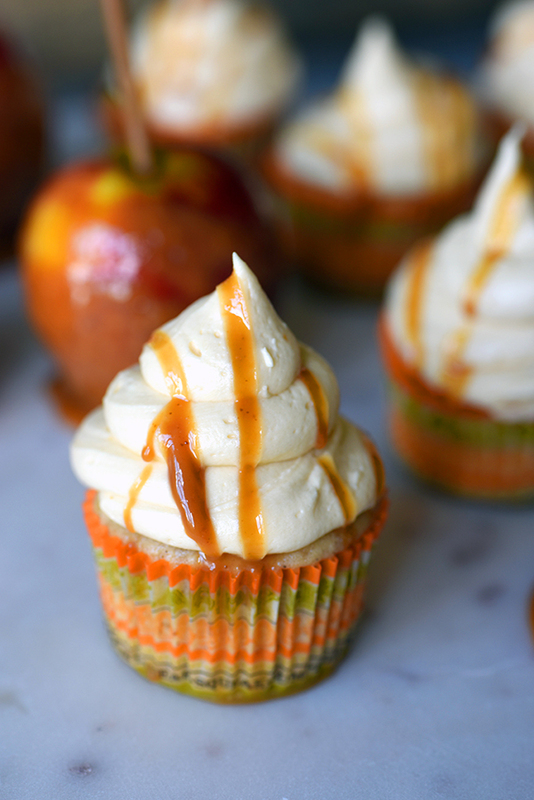 These cupcakes turned out moist and warm with bits of apple and cinnamon running throughout. The caramel cream cheese frosting added a smooth texture topped with a sweet caramel drizzle. 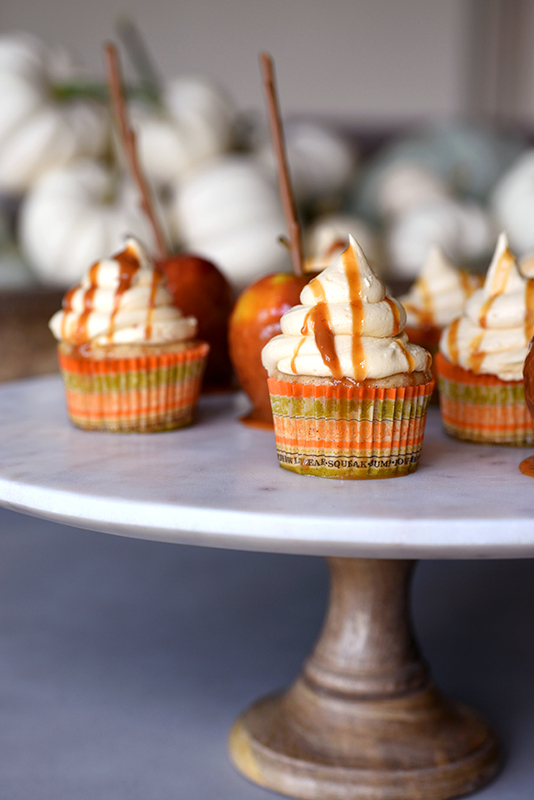 Served alongside caramel dipped apples, it made for the most festive fall treat. Whisk together flour, sugars, baking soda, baking powder, cinnamon and salt in a large mixing bowl. Add egg whites, vanilla extract, sour cream, milk and butter and mix on medium speed just until smooth being careful not to over-mix. Fold in chopped apples. Fill cupcake liners about 3/4 full and bake for 17-19 minutes. Allow to cool completely before frosting. To make the frosting, using an electric stand mixer fitted with a whisk attachment, beat butter on medium speed until creamy. Add cream cheese, caramel and vanilla; beat until fully incorporated. Gradually increase mixer speed to high and continue beating until light and fluffy, scraping down the sides of bowl as necessary with rubber spatula. Gradually add confectioners’ sugar, beating on low speed, until well combined. Beat on high speed until well combined and smooth while scraping down sides of bowl as necessary, about 2 minutes. Fill piping bag with frosting and frost the tops of the cooled cupcakes. Drizzle iced cupcakes with remaining caramel. Serve immediately or store in an airtight container in the refrigerator. Bring to room temperature before serving.